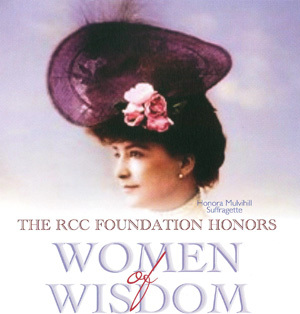 Good afternoon and welcome to the Rockland Community College Foundation Leadership Luncheon, whose theme this year is Women of Wisdom. We are so pleased that all of you are here. You are very special members of our community, a word and a concept we take to heart. I am so proud of the RCC Foundation and our RCC family. Through our collective efforts we will provide to our students over $300,000 this year in scholarships and student support funds. As we planned this year’s luncheon and selected this year’s theme, Women of Wisdom, I smiled as I remembered a story about my son Caleb. I smiled more when I realized some things never change. 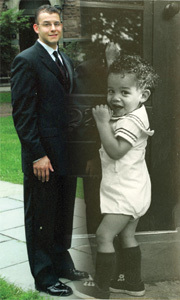 When Caleb was about three, we lived on a beautiful tree lined street in Washington, DC, and there was a band of little boys (6 or 7) who played in our yard all the time. On the next block, there was a little girl named Pippa with beautiful pigtails. Sometimes, in the afternoon, with her mother, Pippa would walk down the block and would stop and spend time with Caleb. One Saturday morning, Caleb and I were in the car doing our Saturday errands, and as we drove down the street I said to Caleb, “Oh look, there’s Pippa.” Caleb who had trouble with “R’s” looked at me and said, “Dad, arn’t gils something.” And as I say now, more than 30 years later, some things never change. But, you know, Caleb was right. Girls and women are something, and it is important in this year, as we celebrate 90 years of women’s suffrage, that we also celebrate the accomplishments of women who provide extraordinary work and leadership in so many areas. It is also important that we honor today, Women of Wisdom, in our community. As we do this, I think about RCC’s responsibility to ensure access and opportunity for women - for all of our students. It is hard to believe that only 90 years ago, women in this country did not have equality. Well, at RCC, women don’t have to wish. RCC’s goal - our goal, is to help our students, whoever they may be, do what they need to do, so they can do what they want to do. I know you’re going to enjoy this special lunch. And now, it is my pleasure to introduce a very special guest….. I am so pleased to introduce our Employee Honoree, Janice Goldstein, who also happens to be an alumna of RCC. Like many RCC students, Janice’s career path evolved. She started RCC with the intention of becoming a nurse. 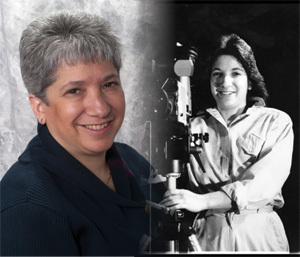 Instead, she pursued her passion for photography, which led her to transfer to study Mass Media at SUNY Plattsburgh. Lucky for us, she returned to work at RCC and continued to grow and evolve, ultimately founding and directing RCC’s award-winning Multi-Media Production Center. Though not officially a faculty member, Janice’s dedication to her students is legendary. Under her leadership, students created RCC-TV and run a popular Annual Video Festival. Janice continues to serve as a mentor and role model to students long after they graduate and enter the media world. I’ve also been informed that on the softball field, Janice was a threat to her adversaries. To quote one of her friends, “Once she was off and running, Jan was hard to slow down before she crossed home plate.” Thanks Janice for hitting so many home runs for RCC. Everyone knows that RCC’s Nursing Program is among the top in the state, with our nursing grads consistently having a very high pass rate on their boards. This excellent record is not a coincidence, but the result of talented and devoted leadership. Dorothea “Cookie” Lever, Professor and Chair of Nursing, oversees a program that has grown exponentially from 119 full time students in its inception to today’s program of nearly 600 nursing students. Together with her colleagues, Cookie Lever is dedicated to fostering student success. She also spreads her educational net into the community by coordinating Diabetes Education at St. Luke’s Cornwall Hospital. Role modeling the importance of lifelong learning, Cookie is now pursuing her doctorate at Binghamton University in the field of diabetes management. As a Woman of Wisdom, Cookie skillfully balances the demands of family and career, as seen in her 33-year marriage and four accomplished children -- a college professor; financial analyst; attorney; and creative art therapist. She also bears the special title of Grandmother to two grandsons. 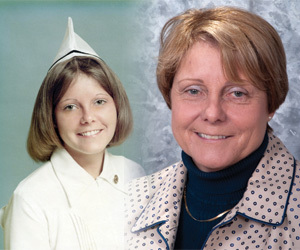 It was her passion for helping people that led Frances Pratt, a 1973 graduate of Rockland Community College, to RCC’s Nursing Program. A Nyack Hospital employee for more than fifty years, she now serves as Manager of Employee Health Services at Nyack. Frances has gained widespread recognition for her civil rights leadership, particularly as longtime President of the Nyack branch of NAACP. Among many other awards, she received the NY State Harriet Tubman Spirit Award, honoring her decades of struggle against racism and inequality. Her frequent personal encounters with racism during her childhood down South served as a catalyst for her to dedicate her life to working on issues of racial and economic justice. The widow of the late Marshall Pratt, Frances has a daughter and three grandchildren, is known for her dramatic hats, which she wears "to show the Victorian blood in my background!" 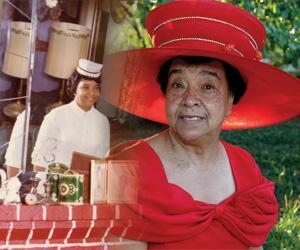 Today our hats are off to Frances Pratt, our alumni honoree!